When the Bullitt Center opened in 2013, it was heralded as setting a new standard in high-performance, net-zero design. Is it living up to the promise? All eyes were on the Bullitt Center when it opened—auspiciously on Earth Day, April 22, 2013. Mainstream and design media worldwide speculated on the promise of the compact six-story structure, in Seattle, topped by a crown of solar panels. It was “a milestone building—one of the most important commercial buildings of the last 50 years,” says Alex Wilson, the building-performance guru and founding editor of BuildingGreen.com. All that publicity was a double-edged sword, of course. If the Bullitt Center was a success, it would be hailed as a model for net-zero design and construction. But if it failed, there would be nowhere to hide. Sure enough, when I visited the Bullitt Center this October, the day could be described—at best—as cold, drizzly, and overcast. How was it that this building could rely on the sun for its energy? A great deal was written about the building at the time of its opening, and again when it got the Living Building nod. Now that the Bullitt Center has been in operation for several years, the time has come to review the performance data, hear from its designers and occupants, and document for wide consumption the lessons learned along the way. Much of the Bullitt Center’s success can be attributed to its design, led by local architecture firm the Miller Hull Partnership and Portland, Ore.–based M/E/P firm PAE Consulting Engineers. But it also hinges on its occupants, perhaps the most well-known of whom is Bullitt Foundation president and CEO Denis Hayes. It may come as no surprise that Hayes, 72, was the principal organizer of the first Earth Day, held in 1970. Later, he was appointed director of the U.S. Department of Energy’s Solar Energy Research Institute, now known as the National Renewable Energy Laboratory. In 1992, Hayes returned to the private sector and joined the Bullitt Foundation, an environmental philanthropy that focuses on the Pacific Northwest. For 21 years, the foundation was located in a renovated (but energy inefficient) carriage house at Seattle’s Stimson-Green Mansion, a National Register of Historic Places landmark dating to 1901. In 2007, when the nonprofit organization needed more space, Hayes proposed constructing a “deep green” office building that would better align with its mission. Renting space in a local LEED Silver office building would have been the sensible thing for the six-person staff to do. “But Denis isn’t really a LEED Silver kind of guy,” says Bullitt Center spokesman Brad Kahn. In a neighborhood dominated by three- and four-story brick apartment buildings, the Bullitt Center is impossible to miss, with its overhanging roof of 575 photovoltaic panels—a 14,000-square-foot home plate, capable of generating 244 kilowatts, perched atop the five-sided, 52,000-square-foot building. The average energy use intensity (EUI) of a code-compliant commercial building in Seattle is 60 kBtu per square foot per year. For projects built to the U.S. Green Building Council’s LEED Platinum standard, it’s 32. In order for that roof of solar panels to suffice as the sole energy supply, the Bullitt Center’s EUI could not exceed 16. In actuality, the building’s EUI has been closer to 10. Despite being located in one of America’s cloudiest states, the Bullitt Center has generated 60 percent more energy than it has used, thanks to its design and its energy-savvy tenants. In 2015, the building even sold nearly 90,000 kilowatt-hours of excess energy back to local utility company Seattle City Light. Turns out solar energy in the Emerald City isn’t such a crazy idea after all. 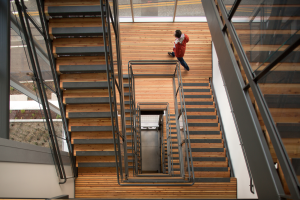 Hayes bet that if building occupants and visitors encountered the stairs first—before spotting the elevator—they’d be more apt to climb them, saving energy and getting exercise at the same time. The staircase hints at the material palette of the top four floors, where Douglas fir posts, beams, and ceilings add warmth to the office spaces. These timber-framed upper floors, made of sustainably certified glulam lumber, sit atop a concrete structure that makes up the center’s bottom two floors. In a city not known for sunshine, the design team took another gamble by designating daylight via floor-to-ceiling triple-pane windows as the primary illumination source for every workstation, on every floor. Using solid 2×6 wood floor panels rather than floor joists allowed for greater ceiling heights, and therefore deeper sunlight penetration. “Just look around,” says Rashad Morris, a program officer with the Bullitt Foundation. “We don’t have any artificial lights on, even on a day that’s completely gray, stormy, and overcast.” Indeed, throughout the building only a smattering of overhead lights and tasklights were in use. The tenants’ prudent use of electric lights is reflected in the Bullitt Center’s metered usage for lighting: approximately 26 megawatt-hours in a year, just 20 percent of that for a comparable code-compliant building in Seattle. Exterior stainless-steel venetian blinds automatically lower over the windows to block solar heat gain on hot summer days, while at night, the windows open to draw in cool air. The blinds were originally supposed to cover all floors, but during value engineering, Court says, they were deemed unnecessary on the sixth floor because the project team hoped the solar array’s overhang could act as a sunshade. Instead of a conventional HVAC system, the building uses a ground-source heat pump system and radiant flooring for heating and cooling. Morris, like many tenants in the building, was wearing a sweater over his dress shirt, but it was hardly chilly at 70 F in the conference room we were sitting in, with a stunning view of downtown Seattle before us. During the center’s first winter, the interior became noticeably cool on some days because the building temperature was kept on the low side—68 F—to ensure the center would meet its restrictive energy budget. “It was kind of a Jimmy Carter, ‘Turn down the thermostat and wear a sweater’ attitude,” Morris says. But the extra layers of clothing were worth it. The Bullitt Center’s HVAC system consumes about 55 megawatt-hours per year, about one-third of that for a comparable Seattle building. Before the Bullitt Center was completed, PAE announced it would open an office in the building—its first in the state. However, the company’s leadership worried about the energy restrictions given their need for power-hungry computers to process engineering analyses and graphics. But after adopting a number of energy-saving practices—replacing some desktop computers with laptops and cutting back to just one networked printer-copier, for instance—the firm has managed to stay within budget. Barely. PAE’s office atmosphere is casual and homey. “Our employees like the natural light, the comfort, even the concrete floors,” Reidy says. But all those hard surfaces—floors, windows, desk—result in what he calls an “acoustically live” space. As soon as the Bullitt Center’s water treatment system is approved by the Washington State Department of Health and Seattle Public Utilities, the building will no longer be connected to the city’s water supply system. In effect, it will become its own water district with rainwater, collected and stored in a 56,000-gallon cistern, as its sole source of potable water. Of all the building’s conservation features, the 25 composting toilets—like what you would expect to find in a national park privy, but odor-free—required “the biggest lifestyle change,” Hayes says. That’s because when you enter a stall, you’re supposed to wait 30 seconds for foam—biodegradable soap mixed with two tablespoons of water—to coat the bowl before you do your business. So, as Hayes puts it, don’t wait until the last minute to run to the bathroom. Solid and liquid waste go straight into one of 10 composting units in the basement. Excess liquid is siphoned into separate leachate tanks, which are emptied every six weeks. Once a composting unit is filled, its contents are collected and converted into GroCo garden compost. “You can buy it at Home Depot,” Kahn notes helpfully. Seattle is one of the rainiest cities in the United States, receiving an average annual rainfall of 38 inches. Rain falls on the roof membrane. Rainwater runs through a debris screen and into a 56,000-gallon cistern in the basement. Overflow is sent to the city stormwater system. Water is pumped up from a floating intake and sent through a series of microfilters with progressively smaller mesh sizes, down to 0.2 micron. The water flows by an ultraviolet light for further disinfection at a rate of 5 gallons per minute, through a carbon filter. and then into a 500-gallon potable water tank. A chlorine treatment tank will be added in the future. Dual booster pumps and a pressure tank take the potable water from atmospheric pressure to 50-60psi for delivery via drinking fountains, sinks, and showers. A water-to-water heat pump, powered by the geothermal heat pump, heats and stores water in two 500-gallon tanks. One tank has an electric resistance booster coil. Graywater is filtered and collected in a 100-gallon stainless steel tank, which empties two to three times each day. The water goes through a second filter with a 1/16-inch mesh, and is pumped up to the green roof, designed by local landscape architect Berger Partnership, and into a wetland treament system, designed by 2020 Engineering. The filtered water gravity falls to an irrigation drainfield to the west of the building. Phoenix Composting Toilets, from Advanced Composting Systems, uses biodegradeable foam to help deliver waster materials into 10 compost units. Excess liquid waste, or leachate, is pumped into four 500-gallon tanks, which are emptied about two to four times a year. Once a composter unit is full, its contents are collected and used to make commercially available compost. By the numbers, the Bullitt Center can be considered an outright success. The building is net positive and fully leased, and all tenants are meeting the astonishingly aggressive water- and energy-use goals. But despite the center doing “everything that we could possibly hope for it to do as a building,” he understands why the construction industry in Seattle hasn’t followed suit. For one thing, the project is very site-specific: The high cost of real estate in the city’s central business district, about a mile away, would prohibit the construction of a mid-rise office building. Even if one could afford it, the neighboring office towers would block the sun from reaching any solar panels. Beyond logistics, the biggest obstacle to overcome in emulating the center’s performance strategies is the short-term mindset of developers, who have little motivation to making energy-saving investments. In fact, after accounting for the savings in utilities and the revenue generated from net metering over the building’s lifetime, along with tax credits, the cost per gross square foot works out to be about $241. To convince commercial developers to go green, “you’ll have to create more incentives, or do it through regulation,” Hayes says. He credits the city with creating the Living Building Pilot Program, which allowed the Bullitt Center to navigate numerous code barriers. One exception gave the building an additional 10 feet of height beyond what the zoning allows, which the foundation used to accommodate the solar array and to increase floor-to-ceiling heights, thus maximizing natural light inside. If Hayes is somewhat philosophical about the Bullitt Center’s power to influence the commercial building market, he has no qualms about the building itself, his beloved “living organism.” The daylight and views. The heated floors. The composting toilets. And, of course, those irresistible stairs. “We have all sorts of things that we measure in the building,” Hayes says. “Here’s my favorite.” He stands up and proudly shows me his belt, with the leather worn in two places: where his buckle sat prior to the Bullitt Center, and its current setting, two holes tighter, thanks to walking six flights of stairs every day. For a detailed analysis on how the Bullitt Center’s heavy timber frame teaches environmental and structural lessons, view this case study.